For the eponymous zone in Sonic Advance, see Angel Island Zone (Sonic Advance). For the Sonic Mania level, see Angel Island Zone (Sonic Mania). Angel Island Zone is the first zone in Sonic the Hedgehog 3. When playing as Sonic, a somewhat lengthy introduction is played in which Sonic and Tails discover the floating island and first run into Knuckles. An alternate version of the intro had Sonic surfing onto the island, which is a leftover from a beta version of Sonic 3. The surfing sprites can be viewed via debug mode. Nemesis created a savestate with a restored surfing intro sequence, which can be downloaded here. Halfway through Act 1, an armada of Fire Breaths attacks the jungle, burning the entire island. 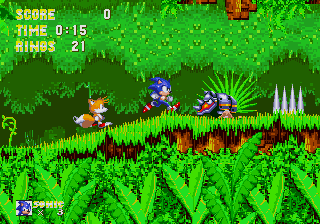 Near the end of Act 2, a green ship (in the US manual stated to be the "Flying Battery Blimp") tries to drop bombs on Sonic and Tails but is outrun by the two. At the end of the zone, Eggman burns off the bridge to the left and ambushes them with his Flame Mobile but is quickly defeated. After Eggman's retreat, Sonic and Tails are dropped into Hydrocity Zone by Knuckles, who destroys the bridge they were standing on. Knuckles was shown to simply jump off the bridge in S3K. 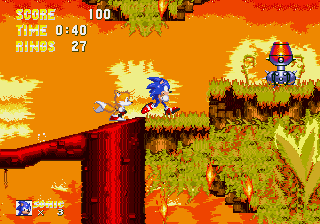 Angel Island Zone in flames during Act 2. In Act 1, when Knuckles robs Sonic's emeralds, it's possible to fly across and catch Knuckles quickly. After that 8 icons of Rhinobot will display and Sonic can go through walls (Example: Sonic can finish IceCap Zone in 1 act). In Act 1, if the player attempts to get with Sonic to Knuckles' sub-boss area by getting through the breakable rocks (which only Knuckles can break) with debug mode, after walking a few steps the screen will automatically try to scroll up to Sonic's sub-boss area, thus killing the player instantly. If debug isn't deactivated after getting through the rocks, the screen will anyways scroll up, but the player won't die because it's still on debug. On the other hand, trying to access Sonic's sub-boss area with Knuckles (Debug mode or Super/Hyper Knuckles only) won't make anything happen. It's possible to go into a Knuckles-only section of Act 2 when playing as Sonic by using debug mode, then go up to Sonic's path after going through the long set of breakable walls. When you get to the boss, there will be two of them - one acting as Sonic's boss and one acting as Knuckles'. This can be used to give a 50000 point time bonus if you use one of the capsules to trigger the end of the level and reset the time to zero, then use the other to trigger another end of the level. After defeating Act 2's Boss, during the Knuckles cut-scene, you can hold left and repeatedly try to jump. If done correctly, you'll jump off the bridge as it collapses, allowing you to avoid falling into Hydrocity Zone. 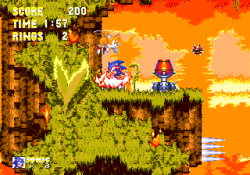 After passing the portion of the level where Angel Island (Act 1) is set on fire, when the player enters a Special Stage Ring or a Checkpoint and eventually leaves it, the background will play the Act 2 music for the rest of the act (and essentially the rest of the stage, not counting the boss battles and the moments after defeating Act 1's boss). The reason why this happens is that, internally, the game has already switched to Act 2. The level being set on fire is simply a distraction while the game internally switches to Act 2, manually playing the Act 1 music in the process. (This was possibly done to change midway Act 1 the green, tropical background from the first act to the red, burning Act 2 background). When restarting, there is a special check to play the act 1 music if the starpost following the cutscene was the last one hit, but a technical error in this check means it fails to work, although even if it did work it would still be possible to trigger the bug with Tails if you bypassed the starpost right after the cutscene by flying over it. An internal level change with the same purpose also happens in IceCap Zone Act 1. As a related glitch, once the player has advanced enough in Act 2, the game deactivates the barrier that prevents the player from backtracking further than the place where the boss fight occurred, the player can then go back as far as the point where the internal level switch took place. While the game still views this as the player remaining in the same level, the player perceives this as actually going back to Act 1, making this the only zone in Sonic 3 & Knuckles that allows backtracking to the previous Act. Nearing the end of Act 2, the character will pass through a long twisting tunnel, and if going fast enough will be thrown into the air off the top of the screen when exiting the tunnel. When playing as Sonic using a fire shield, the player can hold right and repeatedly press jump. The jump sound will sound followed by the fire shield sound, and the screen will move quickly to the right as if there was a platform above the screen from which Sonic has jumped. The level then carries on as normal. When you're playing as Sonic and Tails and get near the end of Act 2, let Tails go through the tunnel first. Then after you passed the tunnel, you'll see Tails standing in his roll pose. He will stay like that until he's harmed. If Sonic or Tails is positioned exactly between the spikes and the Checkpoint, they will go halfway through, then be pushed back out. Rhinobot — A robotic rhino that charges at you. Monkey Dude — Just your standard (blue) coconut throwing monkey. Bloominator — A red flower with a metallic bluestem. Catakiller, Jr. — A blue caterpillar surrounded by a shield-like contraption. Only the head is vulnerable. This page was last edited on 27 November 2018, at 11:20.